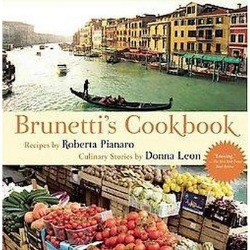 If you dream of Venice with its watery passageways and romantic bridges or devour all the books that Donna Leon writes in her excellent mystery series set in Venice, you will be happy to pick up Brunetti’s Cookbook, named after her famous and kind-hearted detective, Commissario Brunetti. What I have always loved about reading Donna Leon’s books is the feeling of warmth that Guido Brunetti shares with his family. He often escapes the dreariness and danger of his job to take lunch at home with his teen-aged son and daughter and his college instructor wife, who most often prepares their beautiful meals. With Brunetti’s Cookbook, you get to enjoy another way of connecting with the story and life in Venice. Authentic recipes were selected by Donna Leon’s best friend Roberta Pianaro and are interspersed with generous excerpts from the books depicting scenes where the main characters are eating. “Buon appetito,” Paola said and began to eat. Brunetti took a few bites, letting his whole body remember the taste. The last time they had eaten this dish had been towards the end of the summer, when he had opened one of the last bottles of the Masi rosato to go with it. Was it too early in the year for rosato? he wondered. Then he saw the bottle on the table and recognized the colour and the label. Donna Leon says in her forward that after her fourth book came out, she began to notice that readers from outside Italian culture were remarking on the wonderful writing about food in her books. She says that many Italians still see the kind of long sensual meals that she depicts as the normal way to deal with food. To make the food that is in this book gives us a chance to share that way of eating. Recipes range from Shrimp, Melon and Arugula, Orecchiette with Asparagus and White Cauliflower with Bechamel to Savoury Carrots, Chicken smothered with Red Savoy Cabbage and Rabbit with Olives and Walnuts. Desserts include Apple, Lemon, Orange and Grand Marnier cake, Almond cake and Pears cooked in wine and yogurt. Yes, there is a torte di cioccolato, also known as chocolate cake. Paola went to the counter and removed the round top from the porcelain cake dish she had inherited from her Great-Aunt Ugolina in Parma. Inside it, as Brunetti had hardly dared hope, was her apple cake, the one with lemon juice and enough Grand Marnier to permeate the whole thing and linger on the tongue for ever. I’m not an accomplished cook. I seem to be missing a gene for knowing when to check the oven or remove things before all the water boils off, but there are recipes in here that I can do. Potatoes with Cream. Zucchini with Ricotta. I followed generally the recipe for Penne Rigate with Beans and Bacon last week and it turned out very well. “Anything for dessert?” “Figs.” “I love you.” “You mean you love figs,” she said and smiled. What a treat to prolong the pleasure of being in that fictional world by selecting something to make from Roberta’s recipes. The book itself feels great in the hands. The pages of the book open generously. The paper feels thick and smooth and the recipes are graphically pleasing to read, in a friendly font and easy to follow. The stories are waiting. Now all that is required is you, perhaps some music, your kitchen and a glass of grappa. Note: If this isn’t enough inspiration, there is also the book, Brunetti’s Venice, Walks with the City’s best-loved Detective which I am eager to read. This entry was posted in Book Reviews, For Fun, Janis Wildy about writing and tagged Blood from a Stone, Brunetti's cookbook, Cookbooks, Death at La Fenice, Death in a Strange Country, Donna Leon, Gifts for readers, Grand Marnier cake, Italian cooking, Italy, Mysteries book recommendations, Venice. Bookmark the permalink.